Yoga in its integral dimension is an important aspect of Viva Vita, as it is the foundation of the Viva Vita Philosophy and therefore prints the way how to do, to create, to share, to exchange, to serve (Seva), to love and to be compassionate. Spirituality respects all religions in their dimensions, but in the same time doesn’t want to be confused with, as spirituality has a global perspective, looking for the realization of the essence of all faith, looking from the point of view of the cosmic solar system, the five elements and vital forces. Yoga literally means union and communion, and follows the principle that all what is external, as the Solar system, the universe, the five elements and so on, we have in the same time within us, the Microcosm. Therefore the inner study of us – our body, emotions, thoughts and subtle dimensions – serves the deeper comprehension of the outer world body, the universe. Including different ways of approach, techniques and practice we deepen our understanding, evolve our consciousness and respect towards our individual Soul (Jivatma) and towards the Soul of the Universe (Paramatma). In this sense we can analyze the concept of SatCitAnand. Sat is the Divine Creative Energy, AUM – OM – AMIN, than come inside our atmosphere, become Cit, the Cosmic Consciousness, where it will be divided, polarized in the dualistic forces, which are needed to maintain all life system (warm and cold, night and day etc. ), able to densify and manifest the physical world. Ananda is called the energy which is the pacification and harmonization of this polarity. 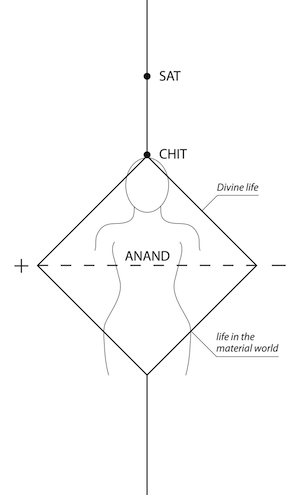 The Triangle below the Ananda line consists all our physical Life, actions and reactions, desires, wishes and tendencies. With the Yoga we search to purify ourselves to reduce the dualistic tendencies and become free to join the feeling of Ananda, the Union with the Cosmic Creative Forces.